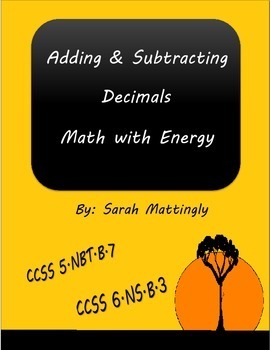 The Math with Energy series is designed to get students up and moving while also practicing math concepts. With answers provided on cards throughout the activity, students receive immediate feedback on how well they know the math concepts. Students enjoy the riddle puzzle at the end of the activity that they solve after collecting letters from each question. Self-assessment is a great tool for teaching the students to assess their own knowledge of adding and subtracting decimals. When student continue to find the correct answers on the cards, they gain confidence in their ability to master the math concept. The students will collect letters with each question that they answer to solve the riddle at the end of the activity. 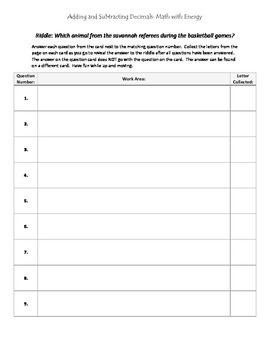 This activity includes 17 cards to post around the room, student answer page and answer key. 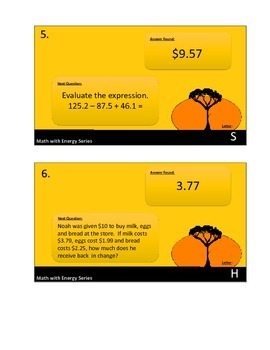 This activity aligns with Core Content Standard 5.NBT.B.7 and 6.NS.B.3 for adding and subtracting decimals. The goal of the Math with Energy Series is to present material while moving throughout the room. 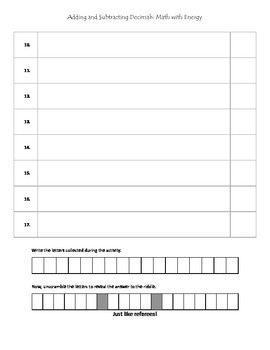 If you are interested in more great activities to get your student up and moving, click the green star in the top right corner to follow me at the Math with Energy store.